Sometimes there’s extra ground beef around that I like to get creative with…. 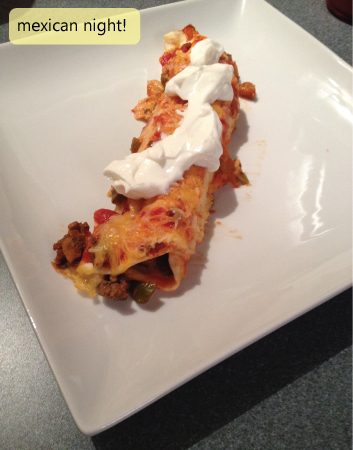 sometimes we do tacos, sometimes it’s stroganoff … but last week I decided to try enchiladas. Beef enchiladas seem a little less common than chicken enchiladas, but I figured they’d make a tasty dinner if I could find a decent recipe! Allrecipes.com was the winner this time. I went with the “Better-than-ever Beef Enchiladas” which seem to be by KRAFT! Sounds pretty hard to go wrong, right? Well, they did turn out pretty darn good…. I would definitely recommend! I added at least half a cup of salsa more than the recipe called for, I dumped in quite a bit more cheese (how is 1/2 cup enough for that many enchiladas? ), and since there are only two of us, I only used 4 tacos instead of 8. Also, when it says brush the tortillas lightly with Italian dressing, it’s not a mistake. I think it adds just a little bit extra flavor and maybe helps keep them more moist. We were out of tin foil at the time, so our enchiladas were pretty dry, but loading them up with some sour cream really helped. Wow, I guess this is a really fattening meal when you add in all the cheese and sour cream, but come on, they’re enchiladas! This week so far has been a lot of cooking. All new recipes, too! I decided today I’d dedicate my Wednesday post to the great recipes I’ve found in the past couple days. Tuesday: We had a nice big hunk of salmon in our fridge so I found this delicious recipe: Real Simple‘s Salmon with Dijon Dill Sauce. YUM! This was surprisingly quick and easy, so this one I highly recommend! Wednesday: Decided to go simple last night since I was having friends over and my husband made a spaghetti casserole I found on Taste of Home. We used this recipe, modified it a bit based on what we had in the cupboard, added a little extra cheese on top, and loved it! Prep time was basically cooking the noodles and mixing everything in the pan and bake time was 30-45 mins. My friends hadn’t even heard of spaghetti casserole and thought it was good–something they will try themselves. Any other good recipes that are easy enough to do on weekday nights? I’d love your ideas! I’m really into “30mins or less” recipes as you can tell. What’s for Dinner | Crock Pot Time! So what did I cook? I went to my Crock Pot pin board and picked out two recipes that didn’t require a lot of shopping. First, I did a really simple Beef Stroganoff from Spicy Richmond. This Crock Pot Beef Stroganoff only asked for 4 ingredients, which I had one of already and I opted out for another one, so it was really my 3-ingredient strog.! My favorite part of this recipe? You just throw it all in the pot, turn it on, and let it cook while you’re gone. I cooked egg noodles and served it over those when I got home from work. I was pretty happy with the way it turned out! My next adventure in the crock pot was Creamy Tortellini Soup from Better Homes and Gardens. 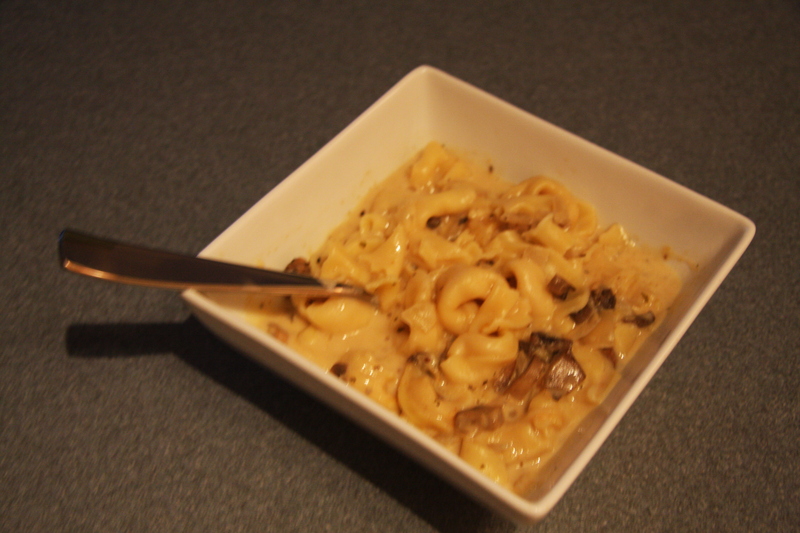 I haven’t done much with Tortellini since I started cooking more, but I sure love it! So I was excited to buy the ingredients for this one (didn’t require a lot of shopping) and cook it up. Even with a few substitutions and things I decided not to put in, this soup turned out delicious. Very creamy and quite filling, but my husband and I really liked it!